Who better than former assembly workers to service customers’ vehicles at GM dealerships, asks GM Canada? Photo courtesy GM Canada. With the looming closure of its Oshawa Assembly plant, GM Canada and its local dealers have made a commitment to train and hire displaced workers as auto service technicians at GM dealerships. GM Canada will also join with Durham Region educators and various governments to train Oshawa Assembly employees and transition them to new careers in Durham Region. The company says these efforts will help address the significant open requirements for talented workers from other regional employers. 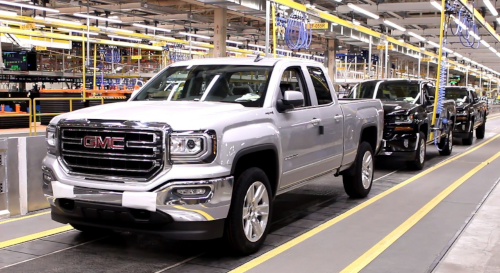 GM Canada will dedicate resources and plans to work with Durham College, the University of Ontario Institute of Technology and the provincial and federal governments. The company will work closely with Unifor to support employees and manage the transition when changes begin at Oshawa Assembly in 2019. “I am deeply appreciative of the quick support and leadership from Durham College president, Don Lovisa, our other local educational partners and our provincial and federal governments in offering support to GM employees,” said Hester. The well-established GM Automotive Service Education Program (ASEP) established and supported by GM Canada’s dealers is available through colleges across Canada to initiate training for interested employees and place them in dealership jobs as they train.